With spring break a memory, our students are taking mandatory tests to prepare them for their next grade level. Before you know it, summer vacation will be here and learning, albeit informally, will continue. During the year there are also alternative learning experiences for all ages. This free event showcases the great educational opportunities and programs available in Galveston schools and local organizations. Come enjoy a “hands-on” experience with many exciting and new learning activities at the school booths and on the lawn of Menard Park. For homebuyers with children, education is a top priority. A way to learn more about GISD is to attend ED Fest 2015. Participants include city of Galveston Families, Children and Youth Board. The city of Galveston, in partnership with Galveston College and UTMB, will present the 6th Annual ED Fest at Menard Park at 28th and Seawall from 11 a.m. to 3 p.m. with Angela Brown as co-chair. 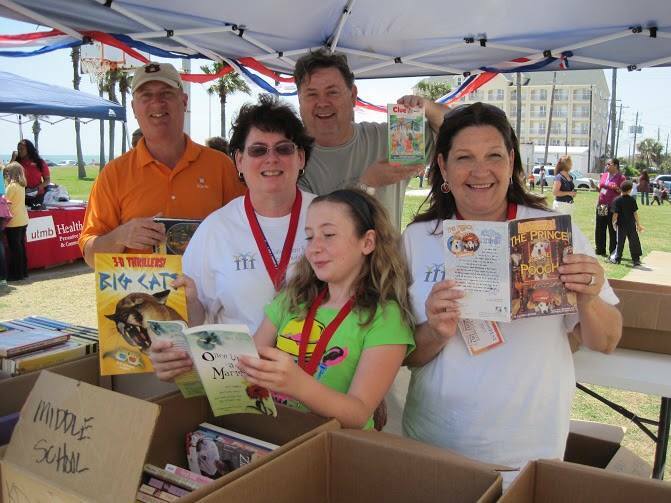 ED Fest 2015 will have lots of giveaways, including free books to families and students. The air will be filled with music and stage performances and there will be games and fun for all ages. A family-favorite is to help paint the annual Community Mural, this year titled “Dive into Education” with a community pool theme. A most important celebration at ED Fest 2015 will be recognizing Galveston’s students, teachers and families who have been nominated as “Education Achievers” this year. Come learn and play at ED Fest 2015 on Saturday, May 9 at Menard Park. I attended the Annual GISD Educational Foundation Fundraiser a few weeks back and met Brian Massey, coach of the GISD Robotics teams as well as some of the Robotic team members. GISD has been very successful in the last few years, winning VEX Robotics Regional, National and International competitions. The VEX Robotics Competition is the world’s fastest growing competitive robotics program for elementary, middle amd high schools as well as colleges around the world, with more than 9,000 teams from 26 countries that participate in more than 400 VEX Robotics Competition events worldwide. Two weeks ago students from GISD competed in the VEX Robotics World Championships in Louisville, Kentucky. BHS Team 6767C (Duncan McPhee, Mason Leboeuf, Richard Mancuso, Jesse Taylor and Nicholas Tobey) competed in the Math Division with teams from 18 diferent states and five countries (China, Bahrain, Burundi, Mexico and New Zealand) finishing with a 4–6 record. Team 400X (Maxx and Xander Wilson) competed in the Science Division and made it to the final round. Maxx has been an enthusiastic member since his middle school days at Stephen F Austin. He explained his love of robotics and how it is helping him to learn more about engineering — a profession he is interested in. I had a great time and loved the enthusiasm all the students showed. Their team name he Torbots is pretty cool too. Kudos to the Galveston ISD Foundation that enriches the educational experience and prepares students for the future by providing financial support to educators, students and schools. It’s a great organization. To learn more contact Executive Director Erin Kay at www.galvestonedfoundation.org. More great reasons why those of us lucky enough to live by the sea are lucky enough.